Online Giving is quick, easy, and secure. 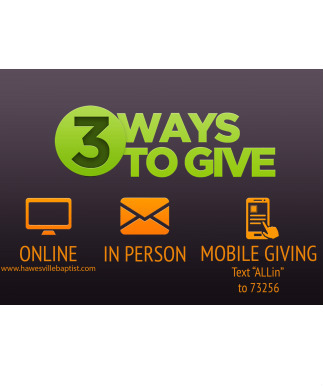 To give via your mobile device, simply text "ALLin" to 73256 and follow the instructions. You can also give online and/or schedule automated giving via Realm, our membership database. Whatever email address you receive our weekly eNews from is your username. Simply request an invite from the church, and we will send the invite to that email address, where you can then set your password and login. To login into Realm, click here. If you'd like an informational guide for online giving, click here. For more information, email us at info@hawesvillebaptist.com or call us at (270) 927-8787. Tithes and offerings make an eternal difference, thank you!